George W. Dunne National Golf Course has got gas. In a new, good way. Cook County Forest Preserve's premier 18-hole course received four pieces of commercial turf equipment powered by clean burning propane. In a program funded by the Propane Education & Research Council, along with R&R Products, the primary goal of the project is to increase awareness of environmentally sustainable programs in the golf industry such as propane power. "Reducing greenhouse gas emissions is the right and smart thing to do," says Jeremy Turton, Superintendent of George W. Dunne. "We are thrilled to be a part of this innovative program and these machines align with BCG's environmental initiatives of promoting cleaner, low emission practices." R&R Products is the first company to manufacture and commercialize propane-powered turf equipment for by the golf industry. 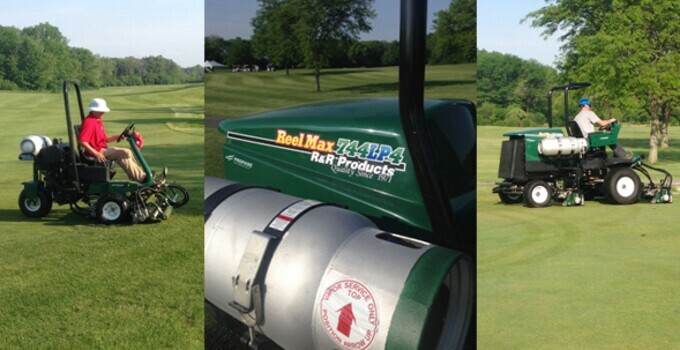 George W. Dunne is the proud owner of a ReelMax 744LP (5-Gang Fairway mower), ReelMax 331LP (Rough Trim Mower), GreensMax 2200LP (Triplex Green/Tee Mower), and SandMax 521LP. Grounds crew at George W. Dunne have noticed the new machines seem to run quieter than their diesel or gas counterparts. Going green has never sounded or smelled so good.